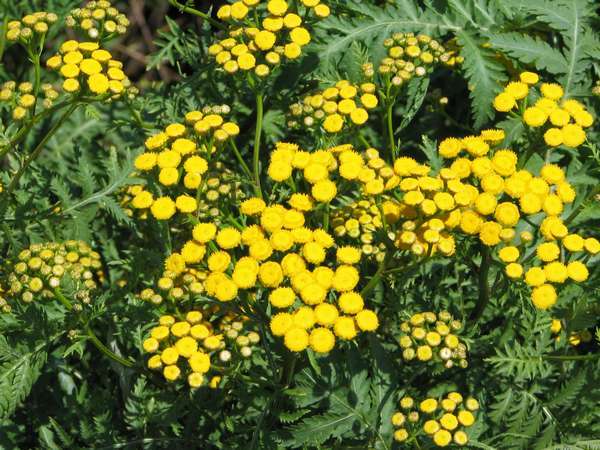 Strongly aromatic erect perennial with dark green pinnate leaves, divided into toothed leaflets. Bears clusters or yellow button like flowers in late summer and autumn. Cut it back when getting untidy. Leaves and flowers. Whole plant. Treat migraine, liver disorders and kidney weakness. Aid gout. Moth, ant, fly and flea repellent. Rub meat with this plant and flies will not sit on it. 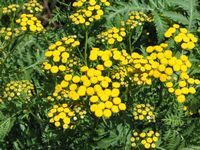 Hang fresh Tansy bunches upside down in the kitchen/ Rub the windowsill and kitchen counter with it to keep flies away. In Finland, it is used as a green dye.